STAAD stands for Structural Analysis And Design. STAAD.Pro software is widely used in analyzing and designing structures – buildings, bridges, towers, transportation, industrial and utility structures. Designs can involve building structures including culverts, petrochemical plants, tunnels, bridges, piles; and building materials like steel, concrete, timber, aluminum, and cold-formed steel. STAAD Pro allows structural engineers to analyze and design virtually any type of structure. Structural engineering firms, structural consultants, departments in construction companies, owner/operators, and government agencies, and offshore platform designers’ use this software extensively. 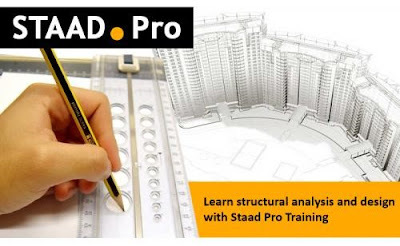 After completing the STAAD Pro training, individuals can work as Structure Designers, Project Managers, Building Analysts, Quality Analysts, Bridge Designers etc. STAAD.Pro comes with flexible modeling environment, advanced features, and fluent data collaboration. It is the world’s number one structural analysis and design software that supports Indian and all international codes. Thank you for your post. It is nice to visit your site.